Amendments made to the Status of the Djibouti Football Federation were unanimously adopted during the FDF annual congress held at the Federation’s headquarters here in Djibouti on Wednesday. 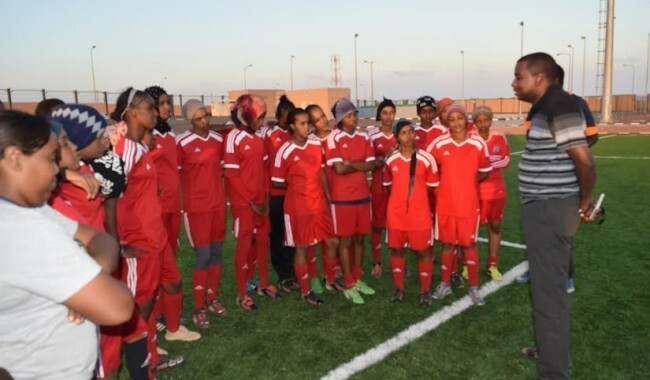 According to the approved status, Djibouti will establish two main associations: the referees’ association and the coaches’ association who will have voting rights in the assembly. The country’s 5 regions were also approved to get voting rights in the assembly of Djibouti football federation. Number of delegates of the general assembly was also reduced from 72 to 40 and was unanimously adopted by the congress. And strategic plans for the next two years. Alexander Gros, Manager Member associations at FIFA and CECAFA representative Amir Abdi Hassan witnessed the congress process in the representation of their soccer organizations. Both officials were very jubilant at the democratic show during the congress which was presided by the Djibouti Football Federation president Mr. Souleiman Hassan Waberi. CECAFA representative Amir Abdi Hassan told the congress that his regional football body was always aware of the football progress being made in Djibouti. “Football in Djibouti made tremendous changes of development for the past two years—-I am insisting this because I know how Djiboutian teams performed at CECAFA tournaments” added CECAFA official Amir Abdi Hassan during his speech at the congress on Wednesday. On his part, FIFA representative Mr. Alexander Gros, described Djibouti as ‘a democratic symbol’ saying that such a congress was a clear indication that Djibouti has fully implemented democratic principles of balance. “If what I have witnessed in Djibouti would happen in every country, it would have been a breakthrough for the global democracy” mentioned Mr. Alexander Gros, adding that the congress went on in a democratic manner. “I am very happy to attend your congress and witness this beautiful gathering” said the director for sport of Djibouti’s ministry for youth and sport Chirdon Kaireh who spoke at the congress on the behalf of the ministry for youth and sports. AS Port FC Chairman Hussein Elmi Bouh said on the behalf of stakeholders that Djibouti’s football was progressing saying that president Souleiman and his executive committee made tangible football developments in the country since they came to power just two years ago. “Within two years, president Souleiman accomplished about 95% of the pledges he made in front of the congress after his election on November 10 2012 and we as stakeholders are promising to play our role in the promotion of football in Djibouti” Mr. Bouh said on behalf of the FDF stakeholders. Djibouti Football federation President Souleiman Hassan Waberi who finally addressed at the congress thanked stakeholders for having a key role in the progress made by the federation for the past two years. “Dear honourable delegates, as some of you have confessed we have been able to implement most of what we pledged on the day of our election two years ago and once again I promise that during my term as president of FDF I will do my utmost to lead Djibouti football into a greater development—We couldn’t have achieved what we did without your support and cooperation” President Souleiman told the congress. He said the constant support and encouragement from FIFA president Joseph S Blatter and his committee was vital for the football progress made in Djibouti so far. “I would also like to thank the President of the Republic of Djibouti Ismail Omar Guelleh for his contribution and commitment to football development in Djibouti—our president is a football-loving leader and we are very thankful to him for his role in our football” President Souleiman Hassan Waberi explained during his closing address at the annual congress on Wednesday.